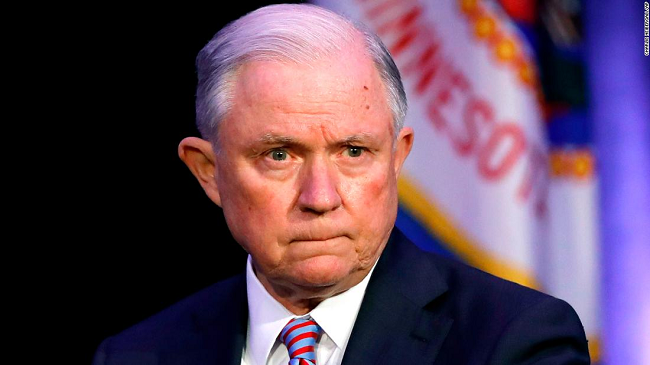 US Attorney General Jeff Sessions submitted his resignation letter to White House Chief of Staff John Kelly Wednesday at the request of President Donald Trump. In the letter, Sessions touted the record numbers of “violent offenders and firearm defendants” the Justice Department prosecuted while under his watch. Trump announced via twitter that Matthew Whitaker, Chief of Staff to Sessions, would take over as acting attorney general. Whitaker has the ability to take over managing the the Russia investigation, and special counsel Robert Mueller, from Deputy Attorney General Rod Rosenstein. Sessions was once one of Trump’s most vocal and earliest supporters during the 2016 campaign. However, his resignation has been expected for weeks leading up to the mid-term election. In the past, Trump has described Sessions in interviews, tweets and press conferences as “beleaguered” and described the Justice Department under Sessions as "Total Joke!" In September, Trump indicated his fractured relationship with Sessions by stating “I don’t have an attorney general. It’s very sad,” in an interview with Hill.TV. The complaints only ramped up in recent weeks, with Trump describing Sessions as “disgraceful” for asking the Justice Department’s inspector general, instead of DOJ lawyers, to review possible FISA abuses related to the monitoring of a former Trump campaign aide. There has been no word on what action, if any, Acting Attorney General Matthew Whitaker will take regarding the Russia investigation. The ouster of Attorney General Jeff Sessions by President Donald Trump on Wednesday drew sharp criticism from Democrats, who warned Trump against moving to squash a probe of Russian meddling in the 2016 U.S. presidential election. The probe, led by Special Counsel Robert Mueller under the supervision of the Justice Department, has clouded the Trump presidency. The president had long complained about Sessions recusing himself from supervising Mueller. Democrats raised concerns about Sessions’ acting replacement, Matthew Whitaker, who now oversees Mueller and once argued Mueller’s probe was going too far. They also questioned whether the removal of the top U.S. law enforcement officer was an attempt to undermine or end the investigation. "Congress must take bipartisan action to protect the integrity of Special Counsel Mueller’s investigation," said Steny Hoyer, the No. 2 Democrat in the House of Representatives, hours after Democrats won a House majority in Tuesday’s elections. If Sessions’ departure was an "opening move" by Trump to meddle in Mueller’s investigation, Hoyer said in a statement, "the president must be held accountable." Asked if Whitaker would now oversee Mueller, a Justice Department spokeswoman said: "The acting attorney general is in charge of all matters under the purview of the Department of Justice." A spokesman for Mueller’s office declined to comment on Sessions’ departure. Trump’s personal lawyer Rudy Giuliani told Reuters on Tuesday that he assumed it was “not going to affect” the Mueller investigation. Justice Department rules on special counsels set boundaries on how Mueller could be removed. Under those rules, he could only be discharged for good cause, such as misconduct or dereliction of duty, such as violating department policy. Mueller is investigating if Trump’s campaign colluded with Russia, and whether Trump unlawfully tried to obstruct the probe, along with possible financial misconduct by Trump’s family and associates. The special counsel has brought charges against Trump’s former campaign chairman and other campaign figures, along with 25 Russians and three firms accused of meddling in the campaign to help Trump win. In a Twitter message, the medium he often uses for dismissing subordinates, Trump said he had replaced Sessions with Whitaker, who will be acting attorney general. Whitaker was previously Sessions’ chief of staff. Sessions said in a letter to Trump that he had resigned at the president’s request. Some Democrats quickly demanded that Whitaker should recuse himself from supervising Mueller, as Sessions did because Whitaker wrote an opinion piece for CNN in August 2017 that argued Mueller had too much latitude in his investigation. The Mueller probe should not extend to the finances of Trump, his family or their business, the Trump Organization, he argued. "Given his previous comments advocating defunding and imposing limitations on the Mueller investigation, Mr. Whitaker should recuse himself from its oversight for the duration of his time as acting attorney general," Senate Democratic leader Chuck Schumer said in a statement. Democratic Representative Jerrold Nadler, expected to chair the House Judiciary Committee starting in January, said removing Sessions fit Trump’s pattern of interfering in the work of the Justice Department and Mueller. "Donald Trump may think he has the power to hire and fire whomever he pleases, but he cannot take such action if it is determined that it is for the purposes of subverting the rule of law and obstructing justice," Nadler said in a statement. Republican Mitt Romney, the party’s 2012 presidential nominee who was elected on Tuesday to the U.S. Senate from Utah, also said Mueller’s probe should not be affected by Sessions’ departure. "Under Acting Attorney General Matthew Whitaker, it is imperative that the important work of the Justice Department continues, and that the Mueller investigation proceeds to its conclusion unimpeded," he said on Twitter. Trump was only a few weeks into his presidency in March 2017 when Sessions upset him by stepping aside from overseeing an FBI probe of potential collusion between the Trump campaign and Moscow, citing news reports of previously undisclosed meetings he had with Russia’s ambassador to Washington for his recusal. Deputy Attorney General Rod Rosenstein took over supervision of the Russia investigation. He appointed Mueller in May 2017 as the Justice Department’s special counsel to take control of the FBI’s Russia probe after Trump fired FBI Director James Comey. Despite Trump’s criticism, Sessions aggressively carried out the administration’s conservative policies. He sought to strip federal funding from so-called sanctuary cities and states, typically governed by Democrats, that he accused of sheltering illegal immigrants from deportation. He also announced Trump’s decision to rescind protections for young adults brought into the country illegally as children, and backed Trump’s ban on people from several Muslim-majority countries from entering the United States. A permanent replacement for Sessions must be confirmed by the Senate, which Trump’s Republicans will continue to control as a result of Tuesday’s midterm elections.